This is what the man at the front desk tells me. Standing there comfortably in a short sleeve shirt, I beg to disagree, grumpy from lack of sleep, but he is unmoved by my protestations. I’ve made a point of returning to the Hotel Hosianum Palace in Rome, not only because of its location, but because it has a lovely rooftop terrace on which a buffet breakfast is served. This morning, however, a sign posted in the elevator has directed me to a room in the basement that is utterly devoid of natural light. I find this puzzling. When I awoke in my little room and opened the window I was greeted by a warm breeze and a bright, blue sky. And yet here I am, eating my bacon and eggs sequestered underground. Inasmuch as I love Italy and her people, it is very clear that we each have a different notion of what constitutes inclement weather, and I have been overruled. I don’t linger over breakfast, and it is not just because of the basement. Today is Festa della Repubblica, or Republic Day, Italy’s equivalent of the 4th of July, and a parade is about to begin just around the corner in Piazza Venezia. By the time I arrive it’s just after 9, and every man, woman, and child in the city of Rome has beat me to it. The crowd is thick and heavy, so I decide to watch and wait from Piazza di San Marco, in a copse of trees just opposite the massive white marble wedding cake known as the Vittorio Emanuele II monument. 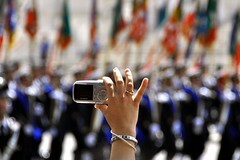 When I stand on tip toes I can see precise lines of military men in plumed hats ascending the steps. I lift my camera and through the zoom lens catch a glimpse of Silvio Berlusconi and Giorgio Napolitano laying a wreath at the tomb of the unknown soldier. 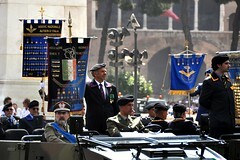 An Italian flag furls in the breeze high overhead. When I visited Rome in 2008, I had to catch a train to Florence on the morning of June 2nd, so the festivities were nothing more than an obstacle on the way to Termini Station. This time around, I am determined to experience it all. There is a momentary lull that follows. I try to navigate up and around the barricades to Via dei Fori Imperiali, hoping to catch a glimpse of the Colosseum, but the weight of the crowd is making me uncomfortable, as are the lit cigarettes that people feel compelled to hold low at their sides despite close quarters. I retreat back to Piazza di San Marco and remain there for the duration of the parade. 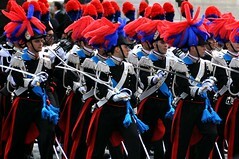 As regiments and brigades stream past in vivid hues, I find myself among some equally colorful people. At 5’5” tall I’m struggling to see past the heads in front of me, yet to my left is a woman who is far shorter. While I’m straining forward on the balls of my feet, she jumping—literally jumping—up and down, talking incessantly all the while on her cell phone. The phone rings. “Pronto,” she says. Again, it rings. Again, “Pronto.” Over and over again. Directly in front of me is a young couple who are doing three things that annoy me greatly. First, the man is holding an umbrella above his girlfriend’s head as if it were a parasol and she was a Southern belle with a delicate complexion in need of protection from the midday sun. Second, even though this Romeo has the manner of an Ashley Wilkes, he has the roving hands of Rhett Butler, which is, shall we say, distracting. And finally, Scarlett has the unforgiving habit of thrusting her camera out at arm’s length in every direction, blocking and very nearly whacking everyone around her, as if the parasol wasn’t bad enough. When her storage card gives out midway through, I smile in silent revenge. That is, until her free hand allows her to light a cigarette. And finally, there is the man behind me. He taps me on the shoulder and when I turn he makes a motion with his hands like a musician playing the trombone and says, in broken English, “zoom, zoom.” I have a telephoto lens on my camera and at first I think he is irritated with me for using it. And what about Scarlett O’Hara, I think. Surely she’s blocking your view with her flailing camera arm more than I am in lifting mine up to my eye? But no. He isn’t angry with me. Not at all. He’s trying to tell me something, although neither of us have the language skills to communicate properly. 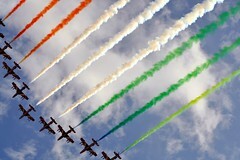 When he taps my shoulder again and points toward the sky, I am just in time to catch a fly over by Italy’s Frecce Tricolori—nine jets in tight formation, releasing streams of red, white, and green smoke behind them. I follow them to the horizon with my camera and in seconds they are gone. Grinning broadly, I turn to my new friend and say “Grazie, grazie, grazie!” He nods and smiles back. As the crowd disperses, I make my way past the Pantheon to Piazza Navona. I grab a mortadella sandwich from a small shop nearby and eat it in the square. Afterwards, I start to search for the nearest 110 Open bus stop, which is only vaguely suggested on the map I received with my Caravaggio card. The red double-decker busses are easy to spot in traffic, but following them is a chore. When I snag one at last, I climb up to the top deck, lean back, and ride for the duration, past St. Peter’s and the Vatican, and Piazza del Popolo, all the way to Termini Station. I duck in to the station briefly to get a train ticket for tomorrow’s trip to Arezzo, which will save time in the morning, then I head to a trio of churches to finish out the afternoon: the papal basilica of Santa Maria Maggiore; Santa Maria sopra Minerva, the only Gothic church in Rome; and San Luigi dei Francesi, home to Caravaggio’s paintings depicting the life of St. Matthew. 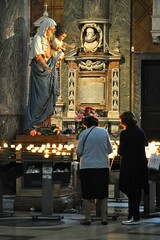 Somewhere I read that there are more 900 churches in Rome. I visited four on my first trip, so that even with another three under my belt, I have at least 893 to go. It’s such a shame, I suppose I’ll just have to come back. 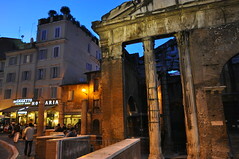 For a celebratory end to the day, I decide to walk through the Jewish Ghetto for dinner at Da Giggetto, next to the ancient ruins of Portico d’Ottavia. I order the house specialty—a Carciofo alla Guidia, or fried artichoke “the Jewish way”—as well as a rice, mozzarella, and tomato ball to start, along with a veal roulade as my secondi piatti. There is a young man from Korea dining solo nearby and he comes over to ask for help with the menu when he sees I have a book of food translations. I chat, too, for a bit with an American family of four and enjoy overhearing snatches of their conversation. Their son and daughter are excited to be here, exploring a new culture in a foreign land, and their enthusiasm for new things is contagious. At the same time, their pleasure in each other’s company leaves me feeling a bit homesick for those I love. After dinner, I walk to the Ponte Garibaldi to call my nephew to wish him a happy 19th birthday, and to gaze one last time at the dome of St. Peter’s. On the way back to my hotel, my eye is drawn to some stenciled graffiti on the side of a building. 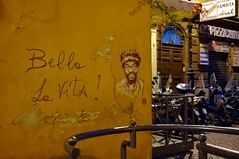 Graffiti is hardly a novelty in Rome. It’s everywhere, on walls, subway cars, and trash cans. I am reminded of my gentle disagreement with the hotel desk clerk over this morning’s temperature, and once again I beg to disagree. Time and circumstance change, of course. When Swaim was here in 1870, the citizens of Rome had just voted to become part of a unified Italy—an historical event best remembered on Republic Day, of all days. But as with the weather, things such as “filth” and “discomfort” are largely a matter of perception. I look again at the graffiti on the wall. Yes. To me, it is indeed.